An “old” cookie that will always be fashionable. Named after General J.B.M. Hertzog, the prime minister of the Union of South Africa, from 1924 to 1939. It was apparently his favorite cookie. This recipe comes from Huisgenoot wenresepte 2 by Annette Human, which is perfect as is, gives perfect results every time, year after year. It is probably the only time I’ve exchanged one of my mother’s recipes for a “better” one! Sift the flour, castor sugar, baking powder and salt together. Crumble in the butter and mix with finger tips until the mixture resembles breadcrumbs. Mix the egg yolks and cold water and add to the butter mixture. Mix to a dough. add a little extra water if it is too dry. Work the dough into a ball, cover and leave aside to rest. Grease the inside of muffin pans. Roll out the dough, about 1 mm thick. Cut round circles with a cookie cutter, big enough to cover the inside of the muffin pan. Press into muffin pans. Put a teaspoon of jam into each dough crust. 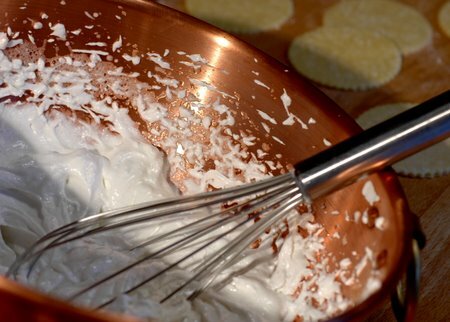 Whisk the egg-whites until stiff and gradually add the sugar to whisk to a meringue. Put a tablespoonful of coconut meringue onto each jam-filled dough crust. Bake for 20-25 minutes in the middle of the oven. Leave to cool before removing. store in a cool place. An entry for “Christmas cookies from around the world” for which Susan at Foodblogga is the host. 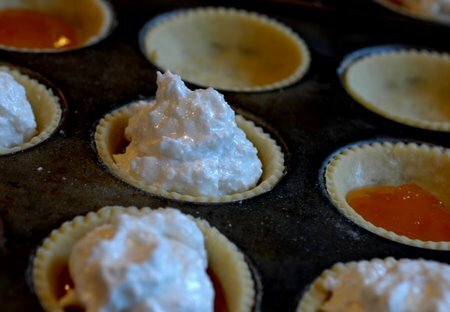 Next Article Turkey and foie gras mini pie. Those are absolutely beautiful cookies – your pictures (especially the one in the cut glass) really do them justice. I’ve never heard of anything like these cookies, so it is a particular treat to read your recipe. Thanks! Wow wonderful cookies. With the filling it must have been delicious. 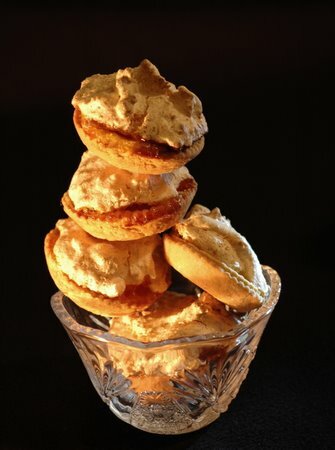 Those cookies are lovely and looks delicious too .And I agree with you some time the old can be fashionable , and with the passing if time became a classic. yum yum , its a first time for me. never seen these before. they irresistible. I am interested in any food with a story or history. Hertzoggies! Love it! The cookie photo and lighting are terrific. Wow those look really tasty. I had a recipe for hertzoggies with the base made a tipe of spong cake, but I have lost the recipes. Yours are wonderful, but to much hard work.